The 2018 Community Engagement Showcase, April 16 in Klarman Hall, celebrated undergraduate and graduate students who collaborated with local and international communities this past year to address some of those communities’ pressing challenges. It also recognized two student projects and one faculty member for their community engagement efforts. 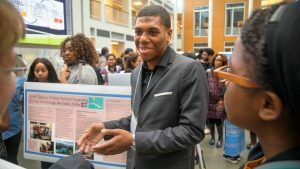 More than 40 student projects, conducted in areas as close to campus as Ithaca and Groton, New York, and as distant as Brazil, Nepal, Kenya, Jordan and India, were highlighted through presentations and posters. They addressed a wide range of concerns, from justice to the arts, food and agriculture to energy and the environment, nutrition, health, law, culture, language, education, youth, seniors, families and economic vitality.